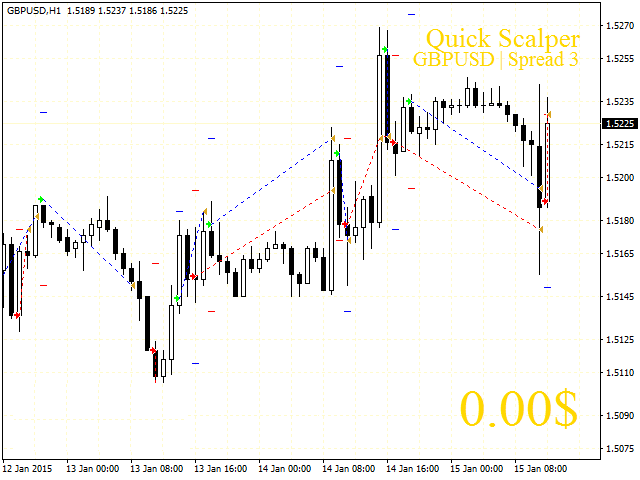 This scalping Expert Advisor works on small roll-backs after a candle is formed. It buys in case of a bullish candle and sells in case of a bearish one. If the price moves in a wrong direction, martingale is enabled. The EA works in both directions simultaneously meaning that buy and sell deals work as two independent strategies within a single system increasing the EA's efficiency and allowing it to earn during a drawdown using reversed deals! The EA demonstrates good results on a quiet market. Try not to trade during news releases! You can set the EA trading time for each day of the week in the robot options. The EA automatically defines four or five decimal places and changes the settings accordingly! Attention! The EA price is to be increased after every few sales. 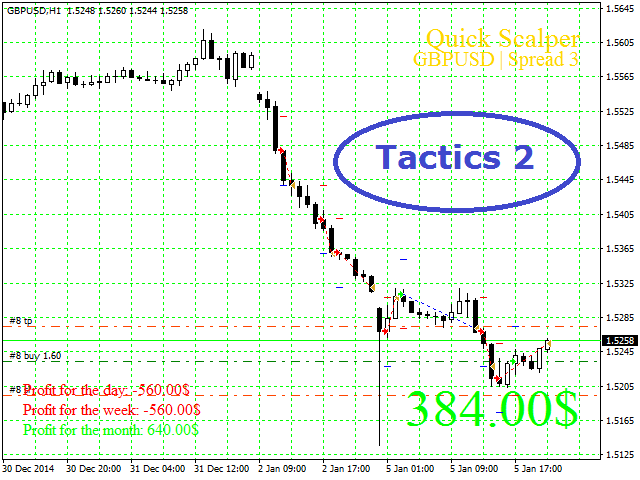 Tactics_1 / 2 - trading tactics. Tactics 1 allows opening orders against the movement, for example, buying in case of a bearish bar and selling in case of a bullish one. 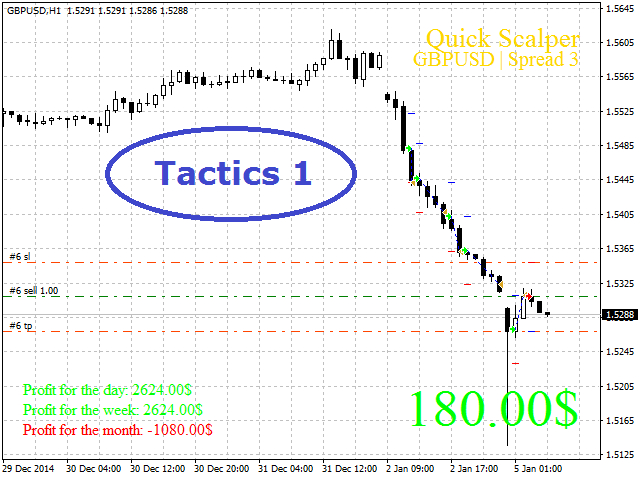 Tactics 2 follows the bar movement: bullish bar - buy, bearish one - sell. You can switch the tactics during trading depending on the market conditions. Auto lot - deposit sum the lot of 0.01 is calculated for. If 0, the lot size from the previous setting is used! Min Step - bar filter. The minimum size of the previous bar is specified here. If the bar is less than the minimum value, the trade is skipped. If the minimum step is large enough, Tactics 1 is most efficient since roll-backs are inevitable! If the minimum step is rather small, the Tactics 2 works better since the market usually continues moving in the same direction. Note that a timeframe is also important! The lower the timeframe, the higher the number of deals and the lower their quality! Time settings for each day of week come next. You can set trading time for each day from Monday to Friday. For example, you can set the EA to work from 12 a.m. to 6 p.m. on Monday, etc.